In order to achieve perfect results with SIBU Design products, its beneficial to have a knowledge of the material characteristics, their storage and processing conditions. Answers to some of the most frequent questions can be found here! 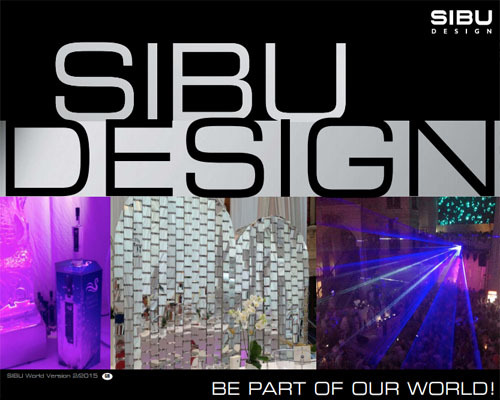 What are the ideal applications for SIBU Design products? 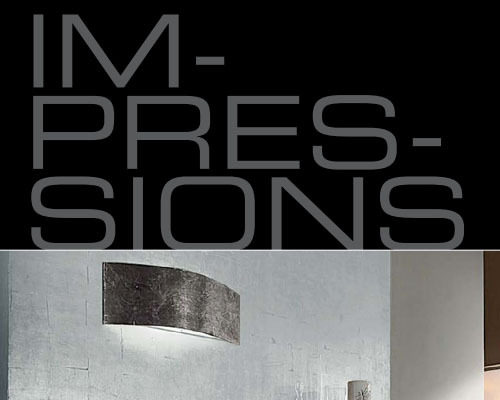 SIBU Design products are decorative elements for interiors and in particular, walls, ceilings, furniture and displays. They are unsuitable as working surfaces or flooring and in situations where there is direct sunlight. In addition, they cannot be used in the proximity of an open fire or outdoors. 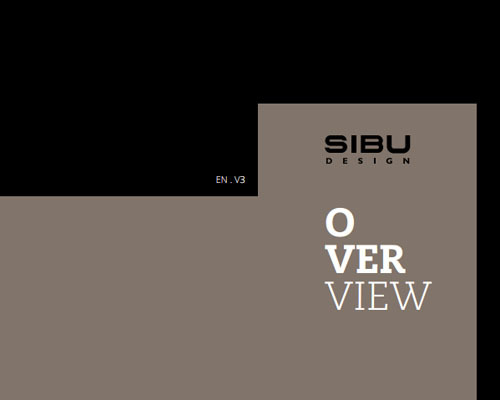 What factors must be considered when using SIBU Design products in a kitchen or bathrooms? SIBU Design products can be implemented in these areas, however they should not come into direct contact with water. Moreover, temperatures in excess of 130°F deriving from existing heat sources must be avoided. Cleaning should be accomplished using a soft cloth and standard plastic or window-cleaning agent in accordance with the degree of dirt. Abrasive cleaning substances cannot be used! What are the most significant differences between SIBU Design products and HPL? 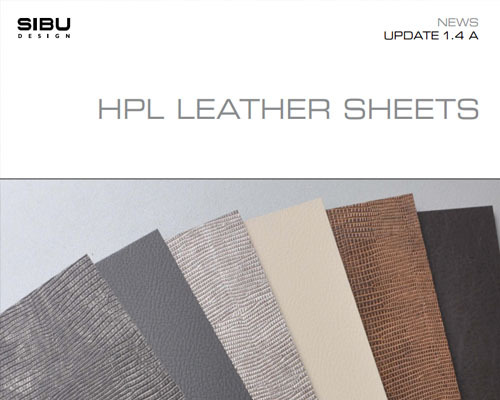 As compared to SIBU Design sheets, HPL has a somewhat cold surface, it is very brittle and can only be processed using machinery. 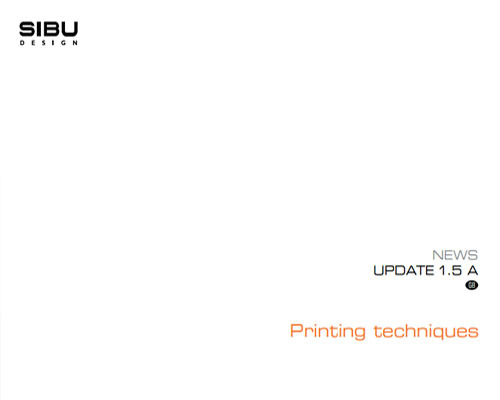 The SIBU Design sheets have a warm feel and can be easily worked without the use of machinery. SIBU Design sheets can be simply mechanically processed, e.g. drilled and cut to shape on site. HPL patterning is applied onto an absorbent backing material (raw chipboard, MDF, etc.) using a press and casein glue under pressure at a certain temperature. HPL always requires counter-pressure. Depending on their thickness and application, SIBU Design products are either bonded, or framed as a filling. No machinery is required for this purpose. Further major differences exist with regard to cutting to length. Up to a thickness of 2 mm, SIBU synthetic products can be easily cut manually using a wallpaper knife. The person can simply score the patterned surface and then snap the sheet off. 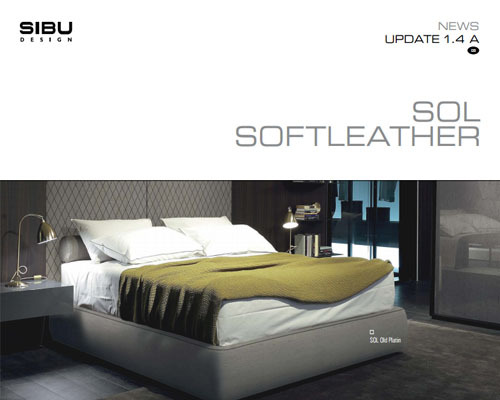 What surface, abrasion and scratch resistance qualities do SIBU Design products possess? The products are scratch-resistant although the extent varies in accordance with the design. This quality is both recognized and accepted by furniture industry. 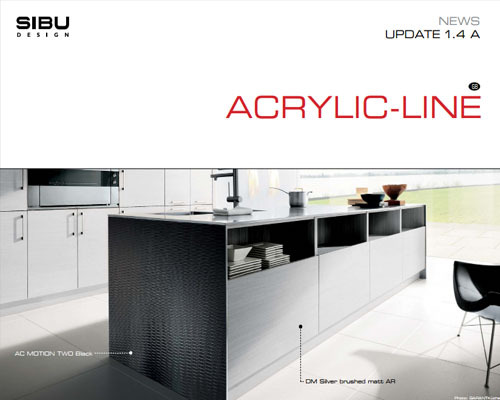 A presentation of the products in line with DIN 68 861-2 is available from SIBU Design. 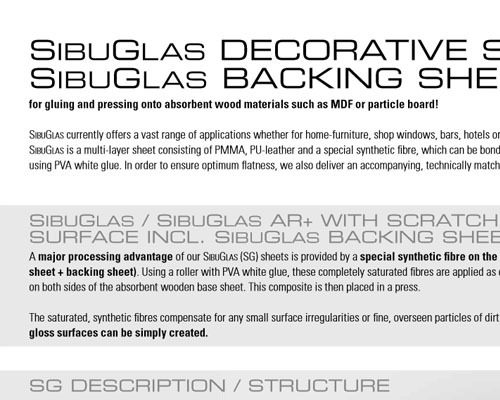 As far as surface resistance is concerned, SIBU Design has prepared a list of 26 different substances (e.g. mustard, butter, citric acid) and their effects after 16 hours in accordance with DIN 68861-2. The SIBU products show excellent results. What must be taken into account during transport, packing and storage? SIBU Design products must always be handled with care. Bending and stacking to excessive heights must be avoided. SIBU Design plastic sheet products are made of thermoplastics, which must be safeguarded against direct sunlight, water and moisture. Rolling is only possible to a certain degree, e.g. SIBU punch-line 3D should not be rolled and stored and transported. After transportation, the products require a certain period of acclimatization. Wherever possible the supplied sheets should be stored in a flat even condition. How do you remove the dust from SIBU Design 3D line perforations? With a soft brush or vacuum cleaner. What bending radiuses are possible with SIBU Design products? In general, the degree of bending depends on material thickness. 0.04″ thick SIBU Design sheets can be used with a minimum radius of 6″. The required condition is that the sheets are not bonded with adhesive, but rother have the ends mechanically anchored into slotted profile. Are self-adhesive SIBU Design products suitable for all grounds? 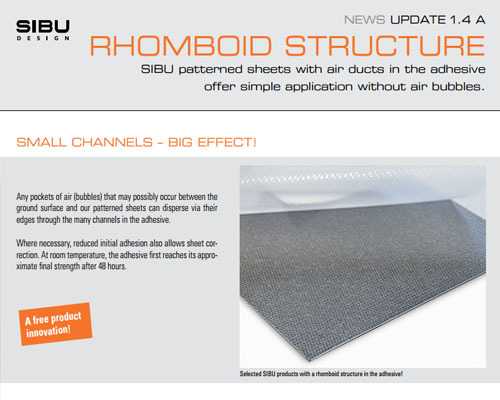 Self-adhesive SIBU products can only be applied to non-absorbent surfaces. The surface must be dry, smooth and free of dust, grease, dirt, wax and silicon. Prior to bonding, the non-absorbent surface must be cleaned with alcohol (ethanol, propan-2-ol). Please ensure that the surface tension reaches at least 38 dyn. Absorbent grounds require sealing with SIBUKLE D22HV or other equivalent glue. What is the effective lifespan of the adhesive on bonded sheets? No bonding problems are known to have arisen during a period of several years when adhesives recommended by SIBU Design are used correctly. However, due to variety of applications, guarantees concerning adhesive life cannot be given. This provision also applies to the adhesive manufactures. Can mechanical damage to the patterned surface on a SIBU Design sheets be removed? The possibilities depend on the individual application, please contact our technical department. What food safety standards do SIBU Design products meet? According to information from suppliers, the raw materials used in production meet the stipulations of the EN71/3 standard, “Toy Safety”. SIBU products do not contain any heavy metals such as antimony, arsenic, barium, cadmium, chrome, lead, mercury and selenium. A related plant certificate is available at SIBU Design. What fire resistance characteristics do SIBU Design products demonstrate? Plastic sheet products generally fall into the “normal flammability” category, but many are available in “flame retardant” versions in line with DIN 4102 B1. Why only some SIBU Design sheets unavailable in 4′ x 8′? Certain SIBU Design sheets are only available in 4′ x 8′ size due to technical production reasons and raw material availability. Can SIBU Design products be used close to heat sources? SIBU Design products can withstand long-term temperatures of a maximum 130°F. Therefore, SIBU Design products can be installed near the heat sources if these generate less than 130°F in their immediate vicinity, e.g. small spots. Applications near radiators, open fires, or in direct sunlight must always be avoided. How do you clean SIBU Design products? The best method is with a soft cleaning cloth. In the case of thicker dirt, a standard synthetic material or window cleaning substance can be used. The substance should be sprayed onto the cleaning cloth and not onto the material surface itself. Light dirt should be removed with a soft cloth only. No abrasives may be used! How can SIBU products be mechanically processed? SIBU Design products can be processed using mechanical circular saws, keyhole saws, hand circular saws, manual and mechanical cutters, wallpaper knives, punching machines and laser cutting devices. 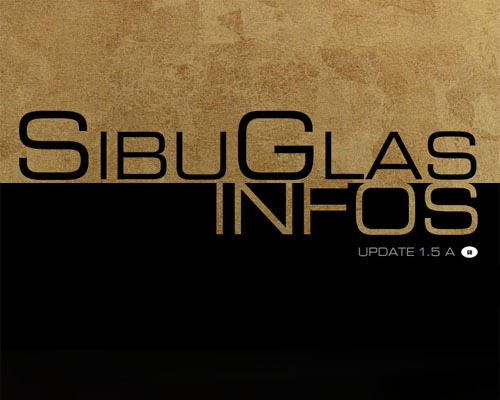 Please contact SIBU Design for details. SIBU aluminum products can also be processed used standard sheet metal working equipment such as plate shears, bending presses and nibbling machines, as well as manual shears and keyhole saws. Please note that cuts must always be started from the patterned side (face)!